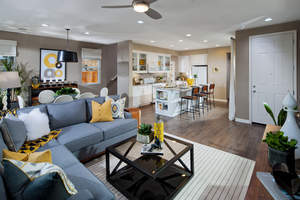 PITTSBURG, CA--(Marketwired - Apr 17, 2014) - It's the end of an era as Pittsburg's lowest-priced new home neighborhood, Villages at Vista Del Mar releases the final phase and beautifully decorated and professionally landscaped Residence 2 and 3 models for sale. This is the perfect opportunity for new home value and a commuter-friendly location near BART and Highway 4, but it won't last long. Interested homebuyers are encouraged to hurry to the Sales Gallery to make their selection before it's too late. For immediate details, log on to www.lyonhomes.com/villages. "The Villages has been a tremendous success and now that we have released our final phase and the Residence 2 and 3 models, anyone who has been waiting for the perfect opportunity to buy one of these family-sized homes needs to act quickly," said Kathy Floyd, Director of Sales for William Lyon Homes. "This neighborhood appeals to homebuyers seeking great value on a new single-family detached home, a commuter-friendly location and affordable prices from the mid $300,000s." Villages' three two-story detached designs range from approximately 1,538 to 1,945 square feet, with 3 to 4 bedrooms, 2.5 baths and 2-car garages. With spacious great rooms that flow into gourmet kitchens with prep islands and private master bedroom retreats, these smart floorplans are ideal for today's families. The neighborhood's location is equally ideal for stress-free trips into San Francisco, Walnut Creek and Oakland. Great shopping, dining, entertainment and recreational destinations are also located nearby. The Villages neighborhood is within the Mt. Diablo Unified School District that includes Delta View Elementary, Riverview Middle School and Mt. Diablo High School. To visit Villages' Sales Gallery and Models, take Highway 4 east toward Stockton/Pittsburg, exit on San Marco Boulevard and make a right. Turn left onto W. Leland Road, right onto Alves Ranch Road, left on Kapalua Bay Circle and follow the signs. From Highway 4 west toward Concord, exit on San Marco Boulevard and turn left. Turn left onto W. Leland Road, right onto Alves Ranch Road, left on Kapalua Bay Circle and follow the signs. The Sales Gallery is open daily from 10 a.m. to 6 p.m. For more information on Villages, please call 925.261.9373. Prices are effective as of the date of publication. All homes are subject to prior sale. Prices and availability of homes are subject to change without notice. Cal/BRE Officer License: 00982816.